The only problem is these little helpers aren’t always the most helpful. Oftentimes, by the end of a long day the last thing you want to do is take twice as long to cook dinner due to the “help” of your little ones. However, the benefits of getting kids in the kitchen are many, even at a young age. 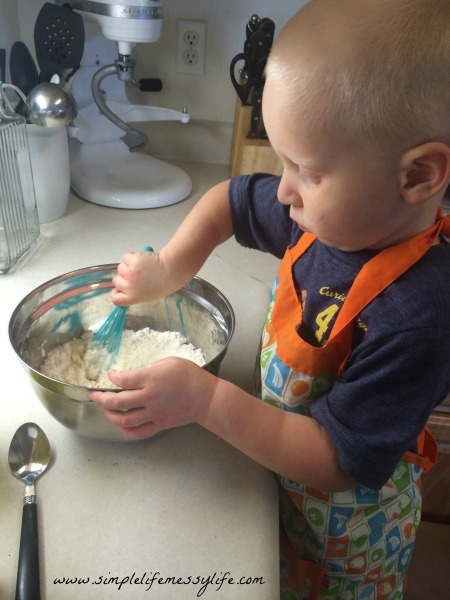 If you want to read more about the benefits of getting kids in the kitchen, check out this great post by Leigh Ann, or find more information here, here, and here. So, you want to include your young child in the kitchen, but how do you get it done without losing your mind or having it take up the entire evening? Here’s five tips to get you started! The times where I am the least likely to want to have a little helper in the kitchen is when I am running around at the last minute trying to figure out what we are going to eat. Having a flexible meal plan relieves that last minute panic and makes it easier for me to plan on my son lending a hand. If you need some help getting started with meal planning, Leigh Ann has a great post here. Having part of your meal prepared beforehand is not only a great way to make cooking dinner quicker and easier, it is a great way to make it easier for your child to help. There are a couple different ways you could accomplish this. You could make use of freezer meals (whether you use them regularly or just for the rushed nights you are tempted to reach for the take out menu). You could also freeze staples such as already chopped veggies, browned ground beef, and shredded chicken. Having some homemade convenience foods on hand gives you more time to allow for extra hands in the kitchen. If freezer meals aren’t for you, another idea is to do a weekly food prep time where you prepare parts of the meals for the week in advance. Chop veggies, cook up some meat, make a big salad, etc. You can also do this on a day to day basis, sneaking in a few minutes earlier in the day to start part of dinner. For example, if you already have all the veggies chopped, making soup with your preschooler is as easy as handing him or her the ingredients to put in the pot and turning it on! Setting your child up at a nearby counter doing an age appropriate task keeps them busy and allows you to work on other parts of the meal. I’ve let my son wash produce at the sink, cut soft items with a butter knife, take things out of their wrappers, etc. 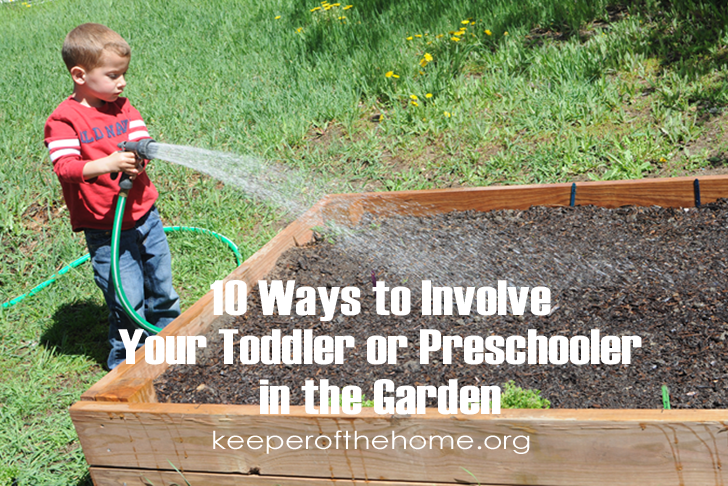 A younger toddler might be happy just to play nearby with measuring cups and spoons. For all these activities, the key is that the mess is contained but he still feels like he is contributing to the cooking. You can also set up an age-appropriate task that you do side-by-side. Examples for this include: you measure the ingredients and your helper dumps them in the bowl, you chop veggies and slide them over so your child can put them in a pot, or guiding your child’s hand as he sprinkles spices onto food. 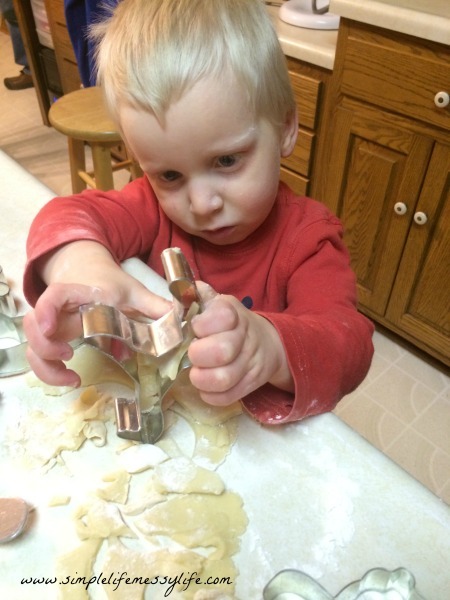 Leigh Ann has a great post outlining what kitchen tasks her son did when he was three. Here is another list of age appropriate kitchen activities that can help give you even more ideas. I briefly mentioned this at the end of tip #1, but I thought it was worth elaborating upon. One of my goals in having my young son help me out in the kitchen is so that someday I will be out of a job. At least partly! At a certain age, I will expect him and any future siblings to be able to work independently in the kitchen. Not only does this mean they will be able to prepare healthy meals for themselves when they are grown and living on their own, but they will also be able to share in the work of the family now. However, in order for this goal to become a reality it means a taking a little extra time to teach specific skills. Having days planned with extra time allotted for these “cooking lessons” makes this a lot easier. A regular weekday evening making dinner might mean that my son “helps” by mixing something that I’ll finish anyways, or re-rinsing something I’ve already rinsed. However, when I plan to allow for that extra time, I can take an extra few minutes to intentionally teach him how to stir until all the ingredients are mixed together or to scrub the veggies until all the dirt is off. Teaching all these lessons now might take a little longer – but I consider it an investment in the future! 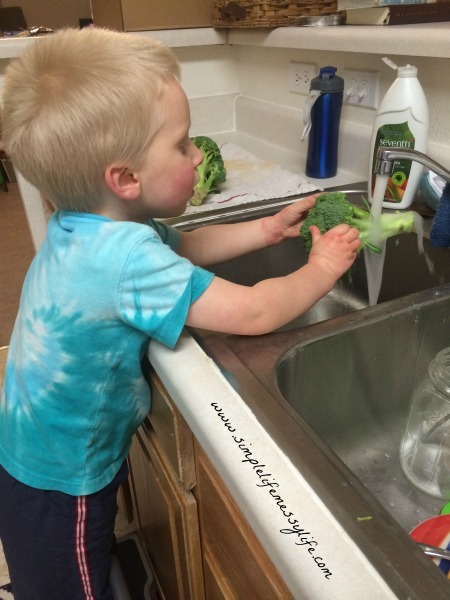 Once the meal is made, don’t forget about including your little helper in the clean up! Like cooking, cleaning up afterwards is an important life skill. Unloading and loading the dishwasher, hand washing dishes, putting things back in the pantry, wiping counters – these are just some of the tasks that little hands can help with! 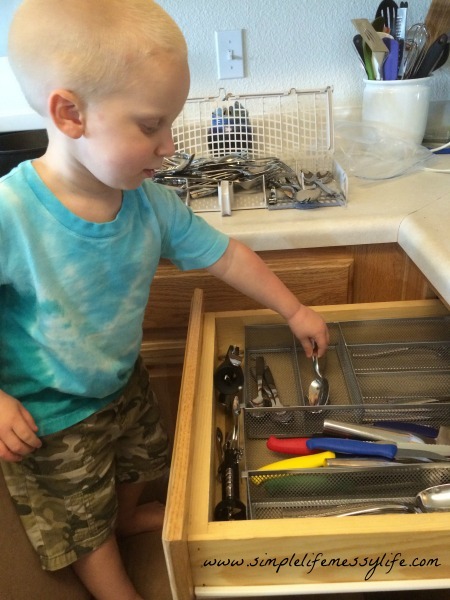 My son especially loves helping with the dishes, something he’s been doing since he was a baby! I need to follow tip #4 and take some time to teach him how to really get the dishes clean (opposed to just playing in the water) so he can add that job to his skill set. 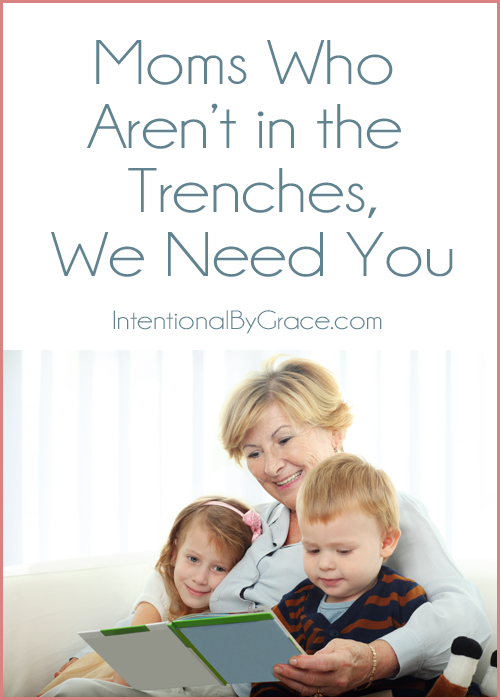 Even if you’re rushed for time, there are still ways to include your child in the clean-up. One of my favorite methods is to give my son a wet rag and let him wipe the counters or table. He loves having his own job and it frees me to quickly get the rest of the kitchen cleaned up. Hopefully these five tips help you find ways to include your child in the kitchen while still staying productive yourself! 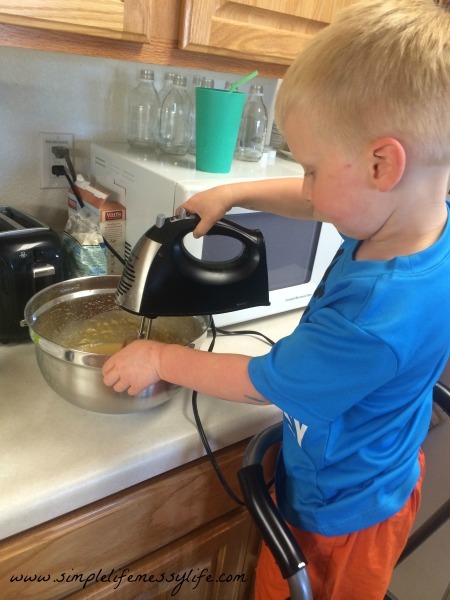 With a little planning and a couple tricks up your sleeve you will be well on your way to guiding your “little helper” to being your right hand helper in the kitchen! 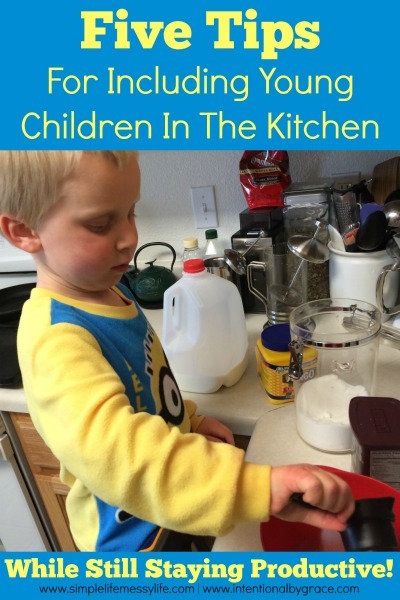 What tips do you have for including young children in the kitchen? Liz is a twenty-something wife, mother, and jack-of-all-trades. When she’s not looking for ways to teach God’s truth to her three year you’ll find her reading, cooking, writing, or enjoying the outdoors. 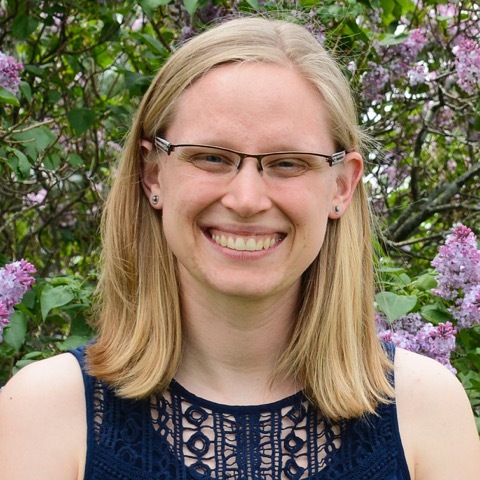 Liz blogs about faith, family, and life’s adventures at Simple Life. Messy Life.